Who is Game-based e-Learning for? Game-based e-learning has been popular in schools for decades, but the potential of game-based learning and training is gradually being realized by the wider learning and development sphere. As they wake up to the massive problems with learner engagement, training corporate professionals have been asking themselves where it all went wrong. When did learning actually stop being fun? The answer is simple: Learning and training lost its luster when the focus was taken off of the people taking the training. Now that the truth is out, there has never been a better and opportune time to be a learner. Let’s take a look at the types of people who are reaping the benefits. In recent years, there have been numerous scientific studies which have confirmed the many benefits of this innovative game-based e-learning method. The findings show greater interactivity with course content, higher completion and engagement rates among employees, and learning/training that stands the test of time. These clear benefits have led the serious game market to be currently on pace to exceed $8 billion by 2022. The cardinal question L&D managers are now asking is no longer whether they should be implementing game-based learning programs but rather how they can successfully do so to get the best retention and engagement rates amongst employees. In digital learning and corporate e-learning, engaging your audience is one of the most important factors in ensuring the successful transfer of knowledge. Game-based e-learning courses use various types of media elements for transferring knowledge, such as animations, videos, infographics, badges, and audio clips. These modes of learning via interactive training games don’t allow learners to share their input or interact with the content. In game-based e-learning, training content is woven into the game. When learners gain knowledge through play, a transfer is more effective. Games promote fun, self-esteem and social interaction. Game-based training content is based on the principle of situated cognition – the idea that knowing is inseparable from doing. The subject matter is directly embedded in the learning environment, and the knowledge gained is practiced in the same context. Even with conventional learning methods, corporate e-learning and social learning play a huge role in motivating learners. When you give users the freedom to interact with their peers, you effectively keep them engaged even after the course is over. 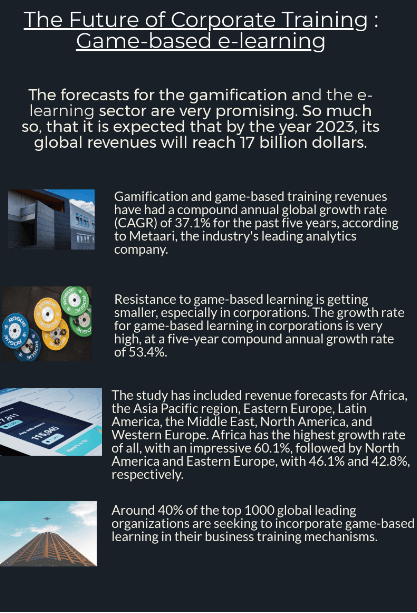 Game-based e-learning content is no exception, and networked gaming platforms have become popular. Inspired by this trend of social gaming, digital learning managers will seek to implement and design games that require teamwork, coordination, interaction and collaboration among learners. Learners are progressively becoming increasingly demanding when it comes to their training. Through a simple Google search, they can instantly find all the information they could ever need which many times are free of cost. For this reason, users need to believe that the training they are being asked to participate in will have a positive impact on them. Your learners want fewer theories, models, and buzzwords. They are in desperate need of more tips, techniques, tools, and tricks that actually have everyday application to their day-to-day jobs. As is the case with all game-based e-Learning courses, you must have a way to track online learner progress and performance. The same goes for the effectiveness of your eLearning course design and functionality. Game-based training analytics of the future are going to be more detailed and easier to obtain. Microlearning games will still play a prominent role in game-based e-Learning. However, long-term gaming is already experiencing a massive popularity surge. This approach transforms an entire eLearning course or program into an immersive and interactive game-based e-Learning environment. Online learners must complete game-based e-Learning modules and activities to earn badges or progress to the next level after completing the level objective. 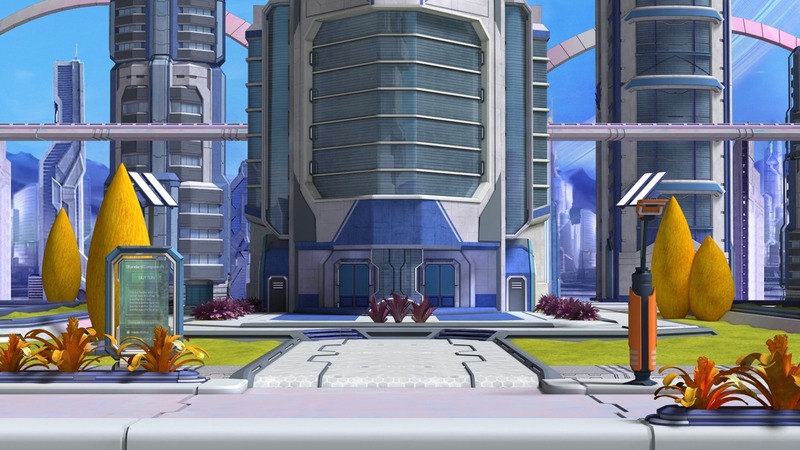 Larger milestones, such as finishing an entire game-based e-Learning course, allow them to defeat the “boss” or unlock the next stage. Long-term eLearning games can even include simulations in real-time to help the learner feel familiarized with the environment and the activities conducted within it. For example, online learners must increase their sales figures and customer satisfaction ratings by performing daily gamified tasks. Game-based eLearning via interactive training games is already headed in this direction. But the future is going to bring even more tactile eLearning gaming experiences for on-the-go learners. From tablets and smartphones to wearable tech, online learners are going to be able to step inside immersive risk-free game-based e-Learning environments. One of the most significant advancements in virtual reality eLearning. Employees can simply slide on a Virtual Reality headset to gain real-world practice, minus the real-world negative consequences. For this particular reason, responsive design tools are going to be a must-have for eLearning professionals in the future. Personalization will pave the way for the future of eLearning, as a whole, not just game-based eLearning. From mobile learning to corporate eLearning, every sector is looking for bigger and better ways to customize the overall game-based e-Learning experience. In terms of game-based eLearning, you’re going to see personalized gaming paths that feature clickable eLearning course maps. For example, unlock another branch of the game-based e-Learning game if online learners need to develop a specific skill. These personalized user learning paths will also include learner-centered goals, milestones, and reward systems to keep engagement levels high. It is becoming easier to implement a game-based e-learning program in your company. Ultimately, by using these tips and a bit of common sense, launching a game-based learning project is not as complicated as it was 5 years ago. Current solutions are more accessible and cheaper and have overcome the technical and financial obstacles of the past. Therefore, at Indusgeeks corporate e-learning combined with high fidelity learning/training simulations and gamification apps to improve your training outcomes by reducing the training time required (for both learners/trainers) and consequently, reduces the overall costs.